Research by SMG Insight/YouGov reveals that recent allegations of corruption over FIFA’s choice of Qatar for the 2022 World Cup have had a negative impact on the sporting body. Utilising its innovative tool - ‘SportsIndex’ - SMG Insight/YouGov compared public perception of the FIFA World Cup and the Commonwealth Games based on ‘Buzz’ and ‘Impression’ – two of the key metrics tracked daily by SportsIndex across more than 50 sporting events and 17 sports simultaneously, alongside ‘Corporate Reputation’, ‘Recommendation’, ‘Customer Support’, ‘Value’, ‘Satisfaction’, ‘Awareness’, ‘Attention’, ‘Index’ and ‘Quality’. 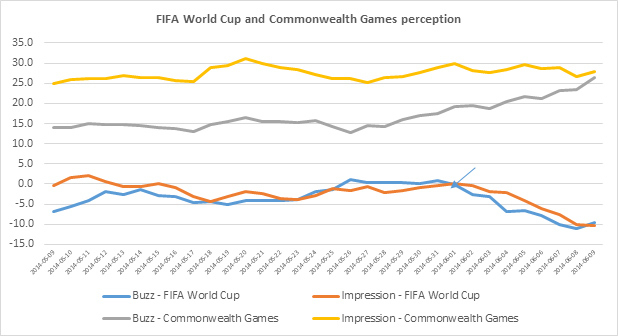 The graph shows that public perception of the Commonwealth Games is significantly higher than that of the FIFA World Cup, with both ‘Buzz’ and ‘Impression’ steadily increasing in the build up to the start of the Games on 23 July. With the countdown to the opening of the FIFA World Cup on 12 June in full swing, it is clear from SMG Insight / YouGov’s research that recent press coverage regarding voting corruption claims has had an unfavourable impact on the public’s perception of the tournament, with more respondents hearing negative rather than positive stories during the last two weeks.